A ranch house typically has one of the most owner/family-friendly layouts of any house type on the market—commonly one level, with living areas on one side and bedrooms on the other. However, many of the ranches on the market today have a choppy feeling that is just as dated as the year they were built: usually the 1950’s and 1960’s. Today’s house transformation, in Nashville, TN, is proof that when you find the perfect designer and builder for your needs and dreams, the results are outstanding. Get ready to see a beautiful house transformation by The Wills Company. The Bond family needed a house overhaul to turn their choppy ranch into a modern marvel that would allow for gracious living, as well as provide entertaining space for the couple and their two young, active children. 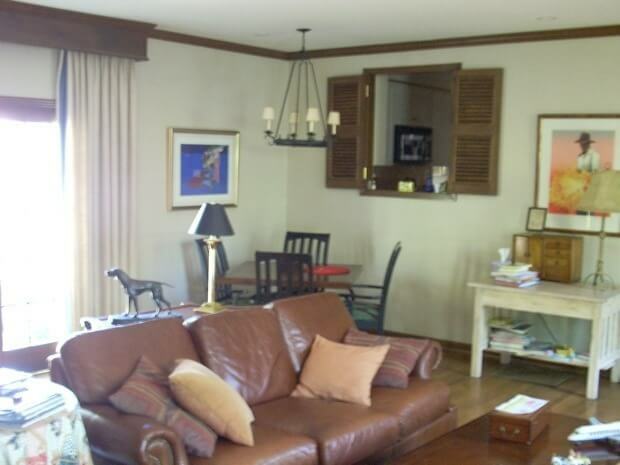 The Wills Company was hired, as they specialize in both design and remodeling. Creative shifting of space allowed the Bonds to stay on budget and they now have a home that lives much larger than it actually is, with easy circulation for both family and guests. Vaulting the ceilings in both the family and dining rooms added architectural interest without having to raise the roof. Keeping the same gray paint color throughout, while making the lines of the house simple and clean, makes this house cohesive and dramatically more contemporary. Today’s transformation shows off the magic that occurs when owners have clearly defined problems that are solved because the chosen design/build team is one that has both the experience and aesthetic to exceed their expectations! Mission: To renovate this 1950’s ranch into a modern house with easy living space for family and guests without adding any more additional square footage. The kitchen “before,” as seen from the family room. Entrance from the kitchen into the family room with the new design. The kitchen “after.” Marble tile on the backsplash and the marble slab on the countertops are both white Carrara. This layout allows for cooking and homework, or a central entertaining hub. Beautiful from any vantage point, all elements of the design are well thought out. Another “before” shot of the family room. Here is the family room after the renovation looking into the kitchen. Notice the wet bar. You can see how the curved, vaulted ceiling adds more visual space to the family room. The dining room after. Notice the two built-in cabinets that practically fade into the walls. The vaulted ceiling in the “after” dining room. The entryway after, updated with cleaner lines and one paint color. Notice the furniture and rugs are the same. Also, note that the subtle differences that make a big impact, like the removal of the walls that previously separated the two sections of this hallway. Now, it flows as one space. And, the chandelier was removed near the door to allow maximum height for guests, as the ceiling is just 8 feet. Interior hallway after. 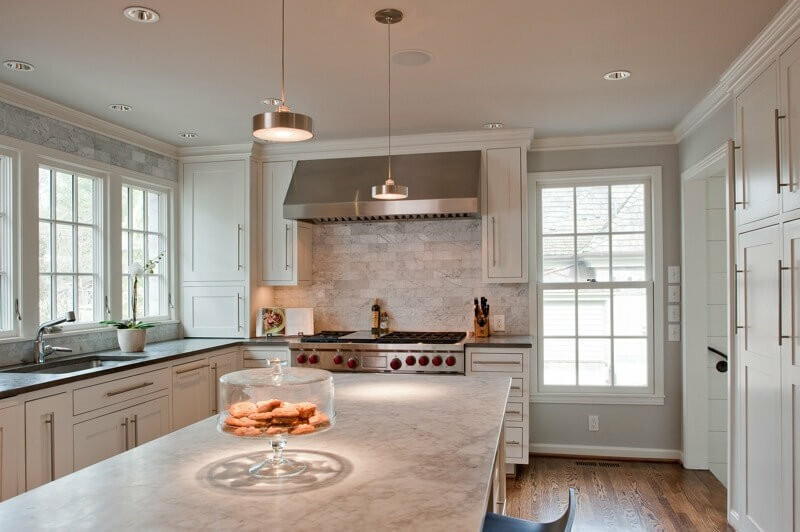 Notice the small, recessed can lighting and the same gray paint color used throughout the house. Both the before and after images show the hallway ending with a focal point (not a door), which is nice. The bathroom after renovation has more space now, as about a foot was taken from the adjoining bedroom. 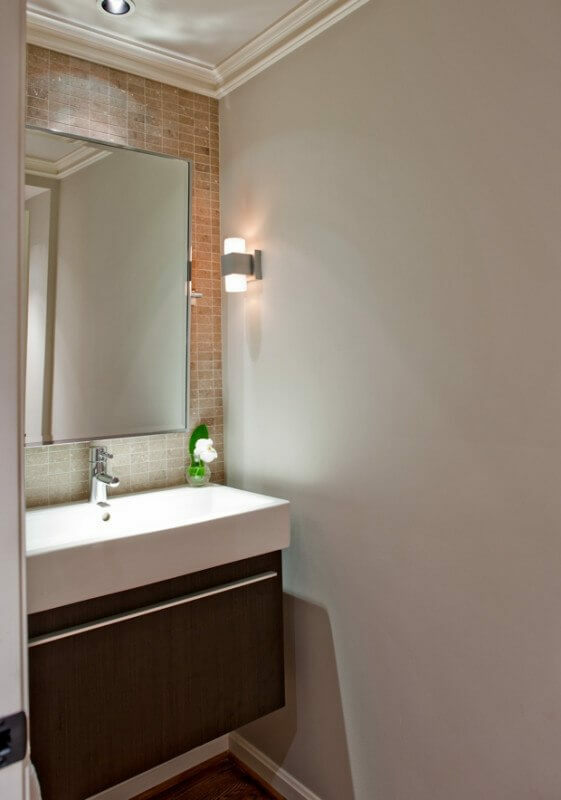 With the added space and redesign, this bathroom change is shocking in such a fabulous way. The new modern shower. Note the marble in the bath and kitchen are the same, for continuity: white Carrara. The new mudroom has a floor that was lowered in order to provide more height for the ceiling without raising the roof. This shot does a nice job showcasing this change. A new powder room was added during the renovation. Previously, guests had to use the homeowners’ private bath, which was a nuisance they wanted to fix. The space came from the living room which is now a smaller room used as a casual study. Today’s house transformation shows that you can make dramatic changes to a house, without one square footage more of additional space, when you have the right team to guide you there. And, they stayed on budget—isn’t that refreshing to hear? Paint: Gray walls: Benjamin Moore, Aura, color: Rodeo; cabinets and trim are Benjamin Moore as well, color: China White.